Reviews and opinions differ so much when it comes to Qantas: some people love 'em, and others moan constantly. As always so with any airline, but particularly when it comes to one that is so inconsistent, know what to expect, and then expect the unexpected. There is no way to ever bend the rules. Qantas staff stick to their manual, and won't go the extra mile. For example if you are on a cheap ticket and you want to change your flight times - tough. You can't. some time in advance, make sure you check the booking online a week or so before you fly. Sometimes flights have been known to be rescheduled to take off an hour before their published time, and you will not receive any warning of this until you turn up at the airport to see your plane takeoff without you. At some of the smaller more rural airports, Qantas staff get very fussy if you take photos of the planes. Just do it anyway; its not illegal. If you are a Qantas Frequent Flyer, you can book you seat in advance, online, through the Qantas website under the manage my booking section. However, Qantas have a decidely odd way of releasing seats in batches as departure gets closer. It's always worth checking your booking - daily, if need be - to see if seats have opened up. The system gives prefernce to Qantas Frequent Flyers who can book ticket a few days before and still have a good chance of getting their seat preference. This is different to many other airlines which gives preferance to the once a year traveller who books months before. They also stop seat bookings when the cabin is full to a certain level. However if you are not a frequent flyer, and have not travelled on Qantas before, this does engender a certain frisson as you travel to the airport with no idea which seat you'll be in, and with a random chance of sitting with your travelling companions. Once about 70% of the cabin is booked, all further seat allocation is put on hold. They retain this flexibility so that groups - families, and so on - can be seated together during a flight, but it sometimes doesn't work that way. People without status on Qantas/OneWorld don't get to pick their seats until 7 days before the flight, however you can ring up Qantas and they can allocate a seat for you. The seat booking systems for domestic have now been aligned in a similar way to international, although there are still a few quirks. Qantas have never publicised the system, however a few experiments seems to show how it works. For a domestic booking, Chairman's Lounge (CL) can book any seat. For example, in business, they can book row 1. Platinums can only book row 2 back, and "lowly" Golds and Silvers, row 3. It's the same in economy, where Platinum members (WP) can pretty much book any seat, except the exceptionally desireable exit rows (Chairmans Lounge only). Gold (SG) and Silver (PS) get a smaller portion of the cabin that they can book. A crucial time, which you should mark in your diary, is 80 hours ahead of the scheduled take off time (That's 3 days and 8 hours), when much more of the cabin is opened up. They often open up row 1 (or 2 for Golds) at T-80 if there are no CL booked. Finally, at 24 hours before takeoff, online checkin opens, and it's pretty much open season for seats (either by Select Seats or OLCI; it doesn't seem to matter either way). 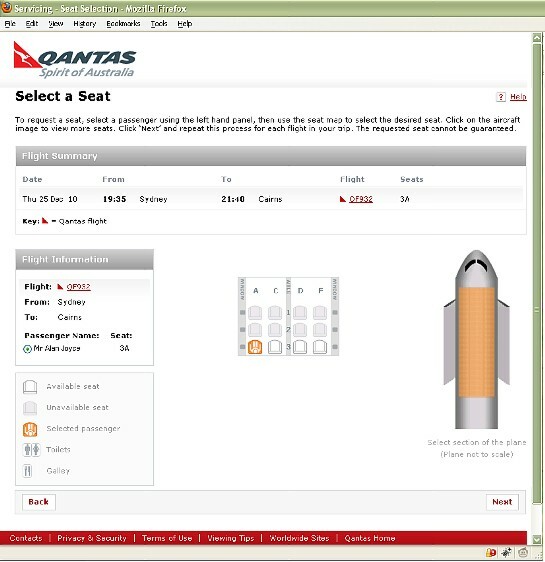 All sectors have individual times for opening up of seats, however the Qantas online systems likes you to book all seats in one go. Therefore, you can do the first leg, accept whatever the second leg is offering, then change the second leg at T-80. On domestic flights, planes change - a lot! - and your nicely booked seat plans can be scuppered. On a 737-800 the danger in row 7 is that a 738 might turn into a 734 and you'll suddenly end up without a window. And on a Qantas 763 avoid preselecting row 25, because substitutions occur and the ubiquitous 763-336 doesn't have a row 25, and you'll end up in the back of the bus. And don't think you can cheat the system by either making a direct amadeus seat booking through CheckMyTrip or even using Expedia's dodgy seatguru system: these seat bookings generally fail to get transfered to Qantas. You can buy a Qantas exit row seat on a long haul flight, and this can occasionally be worth while, although this didn't stop the howls of protests when Qantas introduced this. On the ultra-long-haul kangaroo routes, the extra legroom is tempting, and it also saves you the hassle of having to move other passengers when you want to get up. However, Qantas will make you pay, and pay a lot, for the privalidge. Short haul or Trans-Tasman flights are $40. Between Australia and Asia, it costs AU$80 (or 10,000 Frequent Flyer points) and Long Haul to the UK or US it's a whopping $160 (20,000 points). At that sort of cash, it might be better to look at premium economy, which may only be a few hundred dollars more. These seats are non-refundable, so if you change your flight you'll loose the lot. You can book online, but this system is very flakey: you may need to telephone Qantas to guarantee them. Domestic and 737 flights are totally excluded from the system. Platinum, Gold and Silver Qantas Frequent Flyers (and equivalent oneworld members) can book them as soon as the booking is made. Bronze and everyone else can only book them 7 days in advance. However, if you want to take a chance, you may be able to get exit row seats, or something similar, for free. If you are a Silver or Gold frequent flyer, you'll also get first dibs on exit row seats if any are left at checkin (which is unlikely). Qantas have changed their fare strategy several times, and for internal flights now offer 4 different economy fare types, and one business class fare. Name changes are not allowed on any ticket type. Red E-Deals (N,O,Q) are only available on the internet. Prior to the day of departure, its possible to change the flight destination/time/day by paying A$27.50 (plus the extra cost of the ticket), but no changes are allowed on the day of departure, and the ticket is forefit if you cancel. Super-savers (M,L,V) are the same, but on the day before departure you can cancel and the ticket value can be used towards payment for a new booking anywhere on the Qantas network within 12 months, for a fee of A$27.50. Flexi-savers (K) are the same as super savers, but offer free changes, but you can't cancel on the day of departure. Fully Flexible (Y, B, H) is where you can cancel even just before the flight and get a full refund. These are the same conditions for business class. Business does what it says on the tin. You also get access to the new Business Class lounges when flying on a purely domestic itinery - a new and radical step for Qantas. 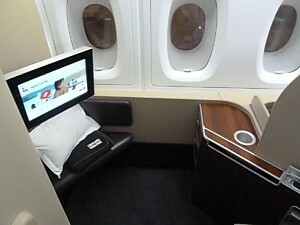 Occasionally when there is a promotion on, business class fares at a weekend are half the price of business class in the week - for example Sydney to Melbourne business comes in at A$295 when there is little traffic, but these fares are very hard to obtain. There are additional ticket classes. In First Z is a First Award, F is full fare. In Business A is discount Business, and U is an Award while J is Full fare. In Economy D is discount Economy, X is an Award, Y is Full fare (B & H are discount Y, but with very few conditions). K is more discounted with some conditions, while M, L, S, V & O are usually heavily discounted. Q is an earlybird and discounted airfare. currency information (the BBC is a good place to start) and you will need to be confident in calculating the exchange rate yourself. If you do this, you will need to give a credit card number, and will be given an Eticket via Email. The savings can be considerable. Note that there is no U in Quantas. There certainly isn't with the new Quantas A380 superjumbo. Quantas reviews can be a bit of a mixed bag: Qantas staff do get upset if you talk about it with a U. A continual promo in London is Australia return for £799, plus 8 domestic flights over the course of a year. Designed for backpackers on Working Holiday Visas, its still a bargain and goes quickly. The best time to apply is October. There is another promo in London, with Australia return for £699, plus 3 internal flights. This can also work out better than booking flights yourself, but there are a lot of restrictions. It often appears in May each year, however it was missing in this years list of promos. Qantas are now deliberately under catering flights between Sydney, Melbourne, Brisbane & Adelaide by 5%. If you want to take a gamble, you can ask to sit in the last few rows. Normally the meals will run out just before you (the last 2 rows in a 737, the last 4 in a 767). You will first be offered a free drink. Then you will be offered free cheese and biscuit. Finally, if you keep on refusing, you will be offered an A$20 voucher. Qantas sometimes reduce the cost of Flexi-savers and Fully Flexible fares at midnight (Oz time) two weeks before the day of the flight. If you really need to book this class of ticket, it can pay to wait to 2pm (UK time) 13 days before the day you want to fly. If it looks as if a flight will still be very empty, Qantas will reduce the cost of Red E-deal tickets one week before the day of the flight. If you book an E-ticket over the internet the fares can be incredibly low, such as Sydney to Perth for A$150, although this is rare. 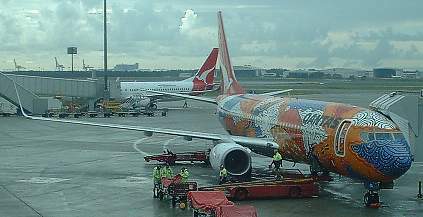 On some routes (notably Melbourne to Alice) Qantas use two-class 737s, even though it is a one-class service. On this occasion the front seats are given to economy passengers - so you can end up in a business class seat, even though you've only paid a cheap fare! Priority is given to passengers who are Silver or Gold Frequent Flyer members, however other passengers who ask to be as near the front as possible can also benefit. Another rare upgrade is to get a four class 747 on a three class route, in which case Business sits in First, Premium Economy taking downstairs business, and Premium Economy in rows 34-37 is open for those with cheap tickets. An even rarer version is a four class on a two class route, in which case there may be a chance of a double upgrade, although in all cases cabin service is exactly what youv'e paid for. You only get a chance to sit in a better seat. One of the common questions is "How do I get an upgrade on Qantas to Business or First class?". Alas, getting upgraded to business class on Qantas really isn't that easy. The airline has the Western, rather than American, model for upgrades longhaul. Which is to say you'll only get an upgrade if your paid for class is full, and then upgrades are processed accordingly to a pecking order of elite frequent flyer status. You are very unlikely to ever get an upgrade unless you are at least an Emerald oneWorld member. Qantas are also notable for the rarity at which they upgrade passengers: they would rather offload them than move them up a cabin: however, it does occasionally happen. To start with, make sure you are a frequent flyer, and you do fly frequently: after all, if Qantas are going to upgrade anyone, they will upgrade those passengers who fly with them pretty regularly, and hence will enjoy the upgrade enough to put more business Qantas's way. Then if the flight is full in economy, and someone needs to be moved up, the check in staff will first look at Platinum Qantas Frequent Flyer members, and then Gold level, and then at other Oneworld members at the equivalent levels (Emerald, and then Saphire, but rarely if ever Ruby). Another thing that Qantas look at is how much you paid for your ticket: it's much more likely to happen with a full fare ticket (although occasionally you can get lucky with a discounted economy ticket). On Qantas the airline has heard - probably hundreds of times a day - requests for an upgrade: the general consensus seems to be that if you ask for an upgrade, you're less likely to get it, although opinions differ on an upgrade strategy for Qantas. Qantas' website is pretty efficient and allows online bookings and loyalty card level checking. It always seems to be available, but lacks inflight entertainment or fleet news. To book internal flights you need to log on to the Australian version, and pay Australian dollars. See the hints and tips section on defeating the website to get cheaper fares. There are two serious bugs in the website. If you select a domestic journey that involves a change of plane, and then click on one of the sectors to see the aircraft type, the website will always shows the duration of that sector as the total journey time between your beginning and end point. The second bug is apparent if you go back to "seach again" when making a booking. The out and return dates reset to todays date each time you do so. This is very annoying, although you can get around it by using your browsers "back" button. There is also a much more minor bug - when making an award booking, if you click on "next day" to see if there are any flights the next day, you are taken back to the beginning of the search, and all the information you entered is lost.